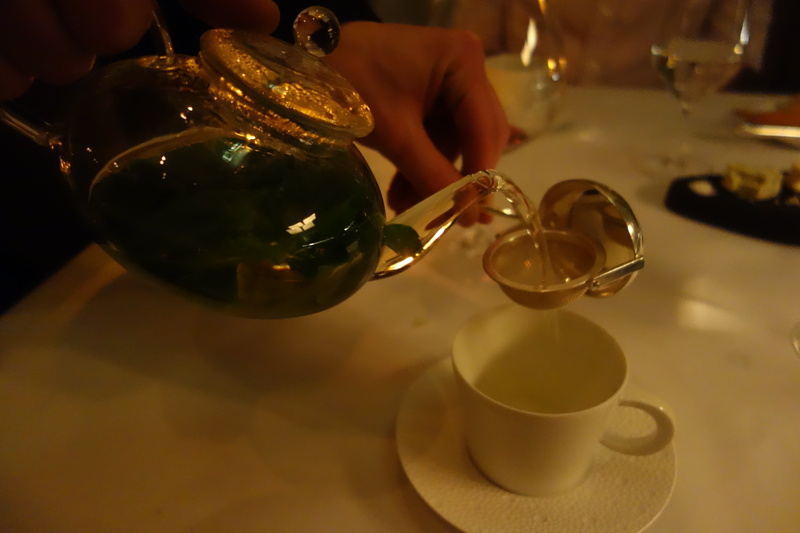 We’d been to a 1 Michelin Starred Chinese restaurant, which had blown our minds. 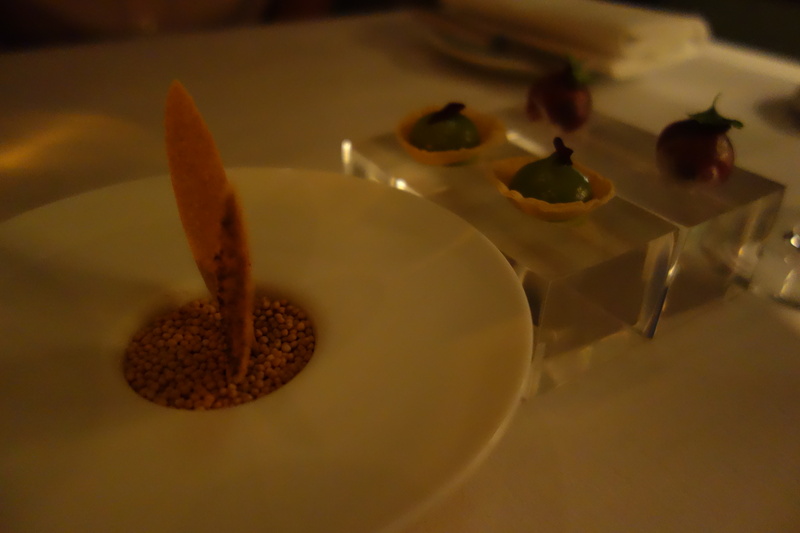 I wanted to follow it up with 2 Michelin Starred French restaurant: The Greenhouse. Again I booked via Opentable as they had some fantastic set menu options. 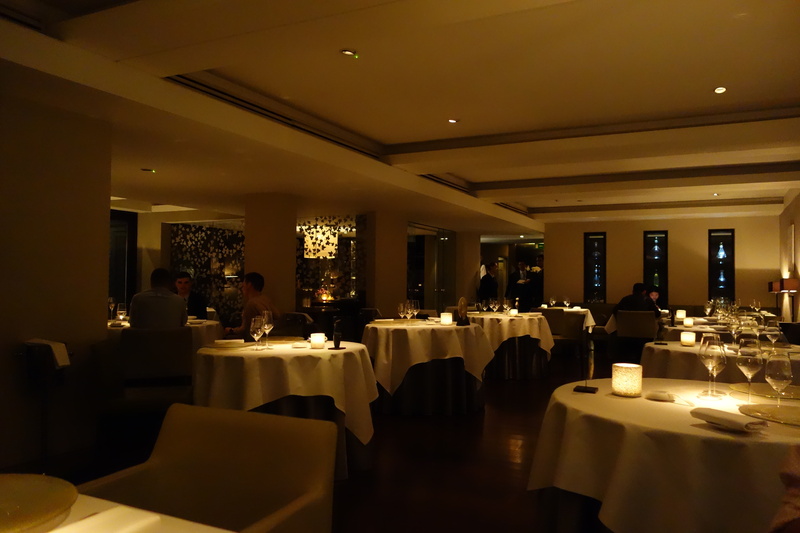 The restaurant had quite a few mixed reviews for a 2* Michelin but we crossed our fingers and hoped for the best. 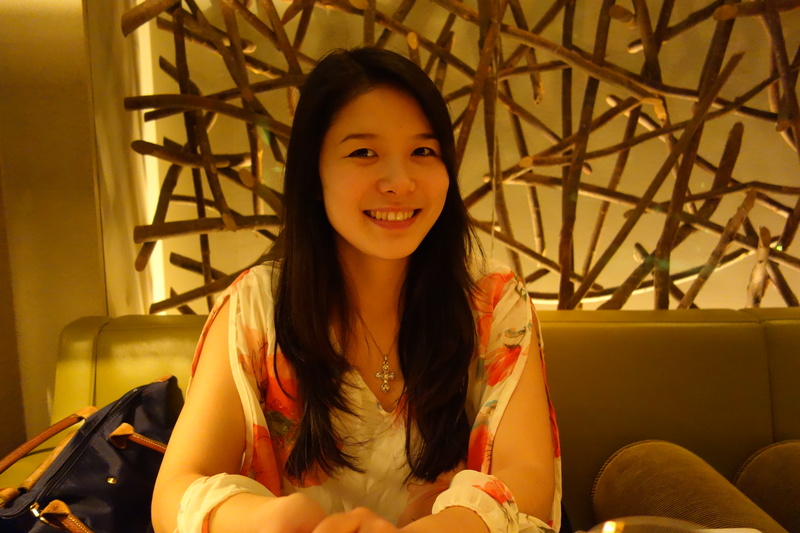 Another restaurant that is tucked away into silent back streets, this one is located in Mayfair. You will recognise the entrance by its ebony gates and beautiful bamboo walkway, surrounded by greenery. We booked for dinner so I wasn’t able to get any photos as it was already dark. Even at night you can still feel the tranquility of your surroundings. 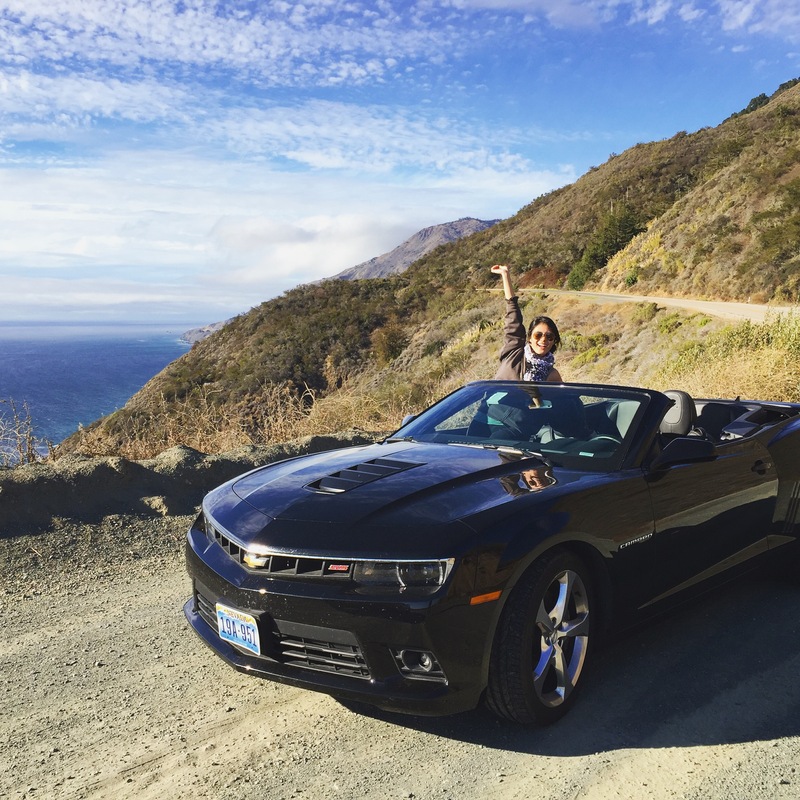 The interior was equally beautiful (did you see my backdrop in the first few photos??) and we were excited with what was to come. 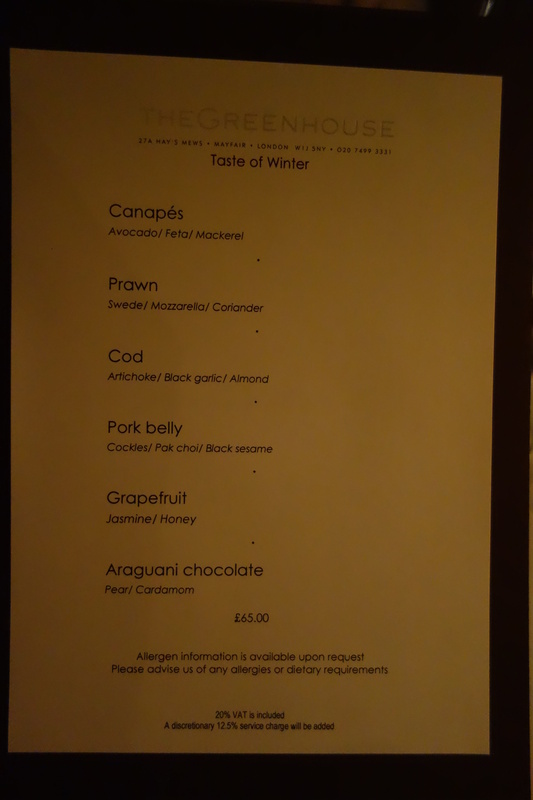 We had the Taste of Winter menu – £65 for 6 courses, petit fours and coffee. I read reviews that portions were very small so wanted to ensure we had a meal that would fill us up. It was a set menu so we had no choice. They served the canapes before showing us the menu at all and I was relieved to find the canapes were not what was listed (no feta as I’m not a cheese fan). I am not a fan of pork either but I can love it depending how it’s cooked. 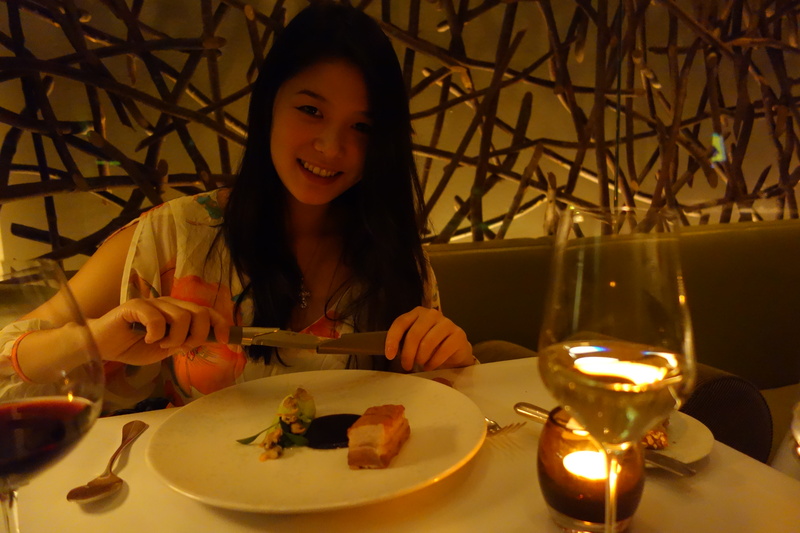 I figured a 2 Michelin star restaurant must do it well, right? Wrong. Ohhh, so wrong. You have no idea how wrong I was. We’ll get there, but let’s go through all the courses in order. 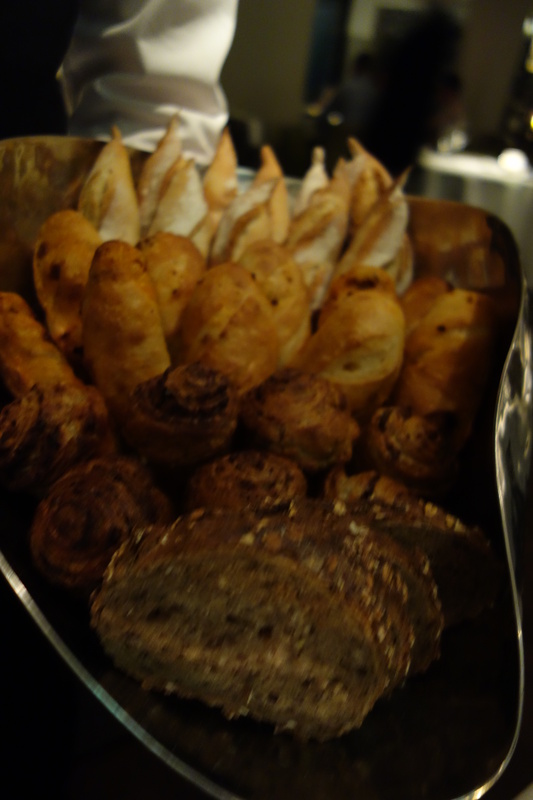 To start: canapes. Some sort of mushroom crisp, something with avocado, and a relatively tasty but meager morsel of steak. I… remember the favours being… interesting. Nothing that blew my mind and made me think ‘wow’, but we figured it’d get better. At this point, I had no idea that interesting would be a running theme for the rest of the evening. 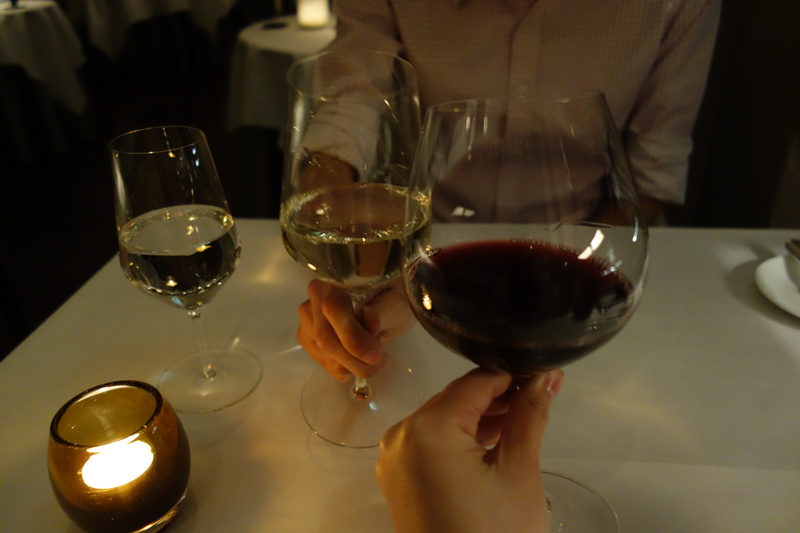 We didn’t want to go with the wine pairings, which would have added an extra £40 per person. 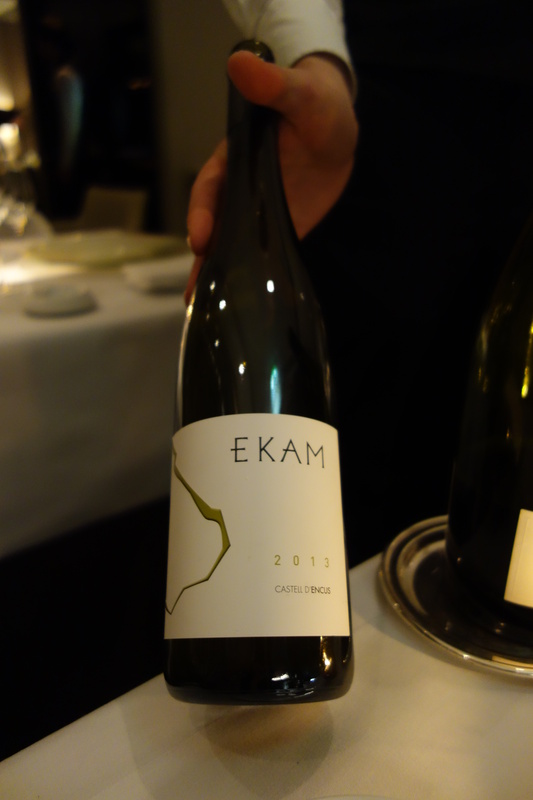 Instead, the sommelier was fantastic in helping us choose wines that would match the whole menu, wouldn’t break the bank and also tasted great. 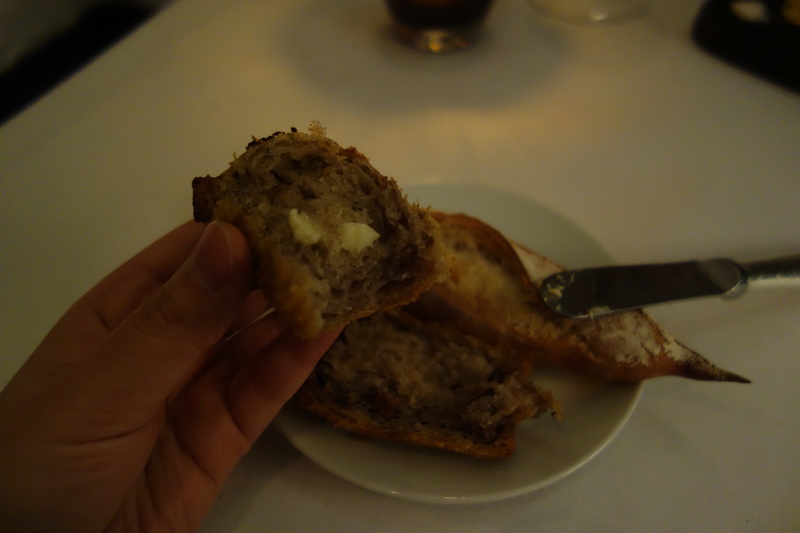 The bread was freshly baked (or warmed) and was very tasty with the butter. 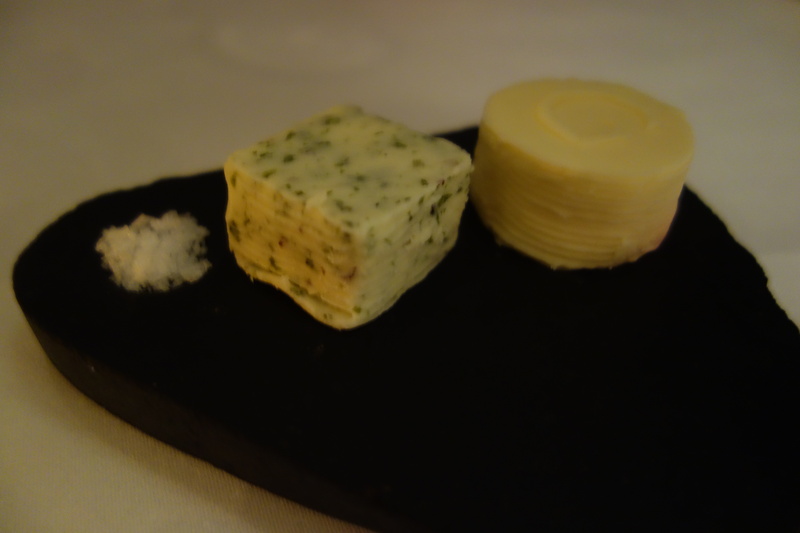 I can’t remember what the green butter was… seaweed butter maybe?? 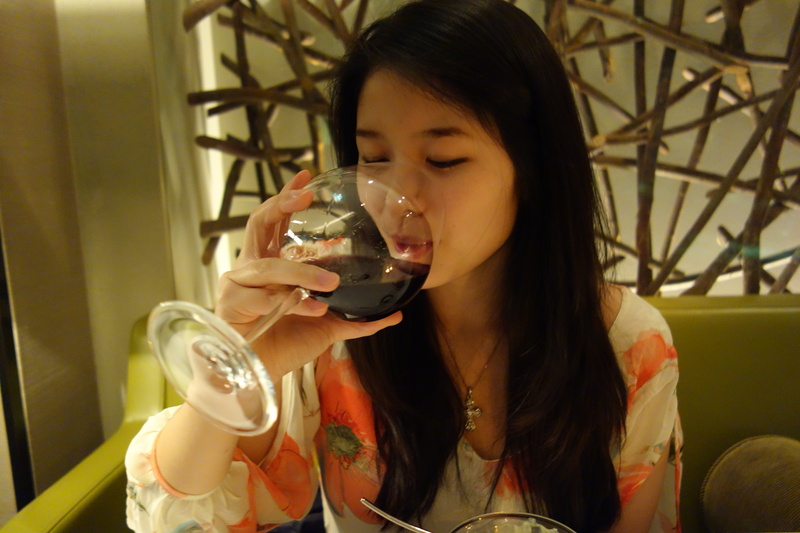 Mmmm, it was very nice wine. I wanted red for some reason, even though the menu was primarily fish. 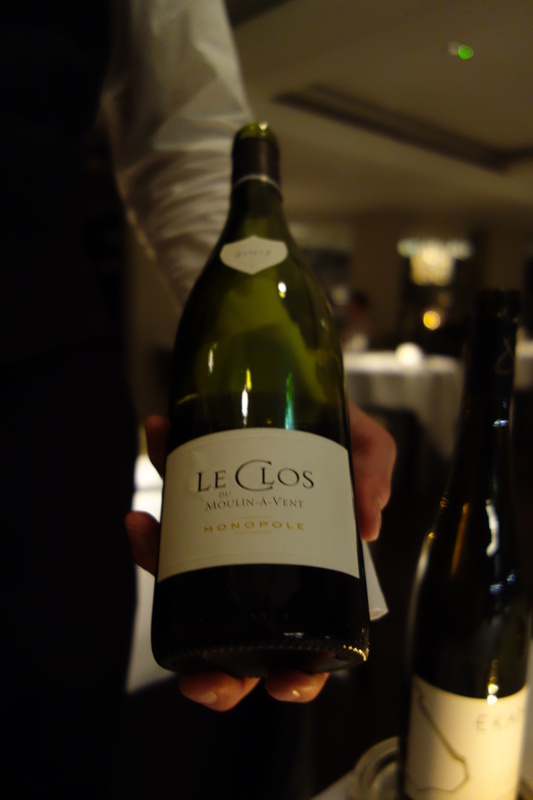 Great job to the sommelier for picking a fantastic red, although as soon as I tasted J’s white I instantly had wine-envy. That was some delicious white he’d recommended. I have nothing nice to say about this dish, sorry. I requested mine without cheese, which they kindly approved, so that may have affected the taste. 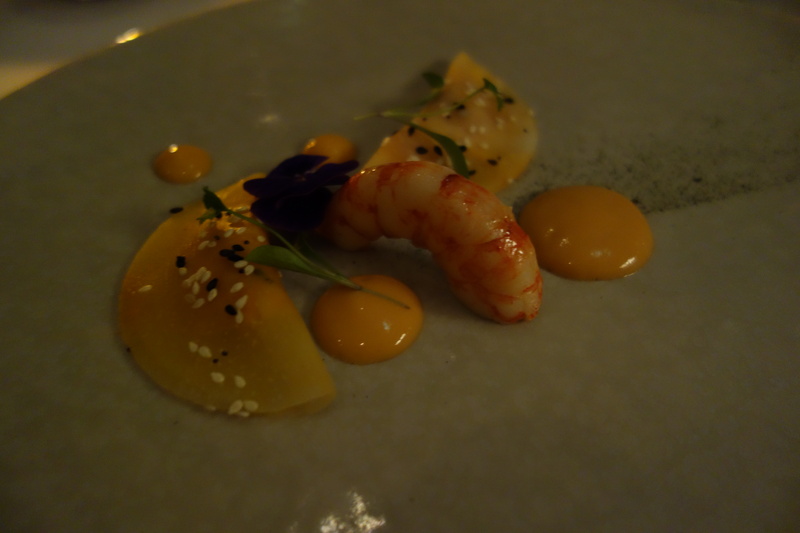 However, the prawn was fishy, chewy and overcooked. The pockets of what I assume is swede were flavourless the filling was a bad kind of wet. I have no idea what the blobs were supposed to be. I still finished it as I was very hungry. 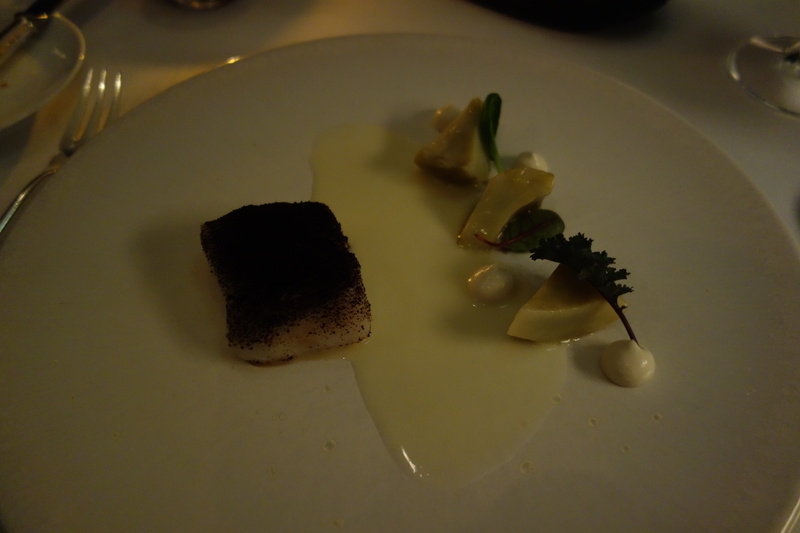 Cod with artichoke, black garlic and almonds. 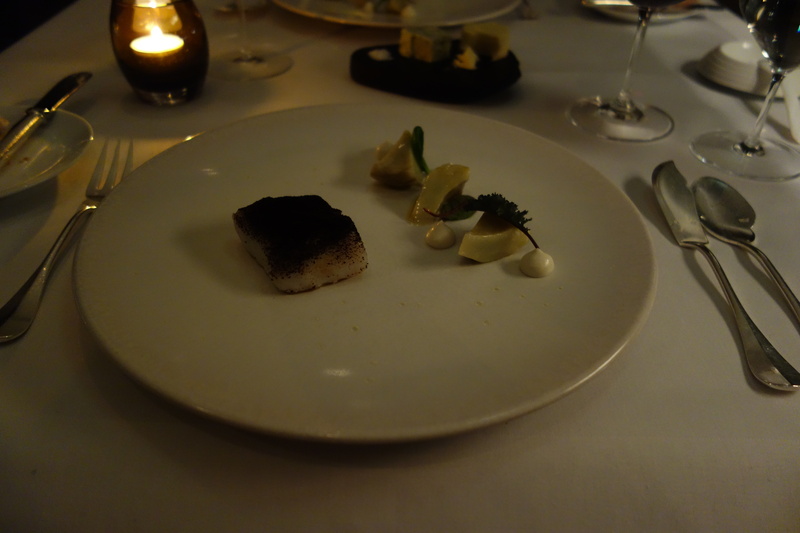 The cod was cooked perfectly and the white sauce complemented it well. The artichokes were cooked okay and decently flavoured. 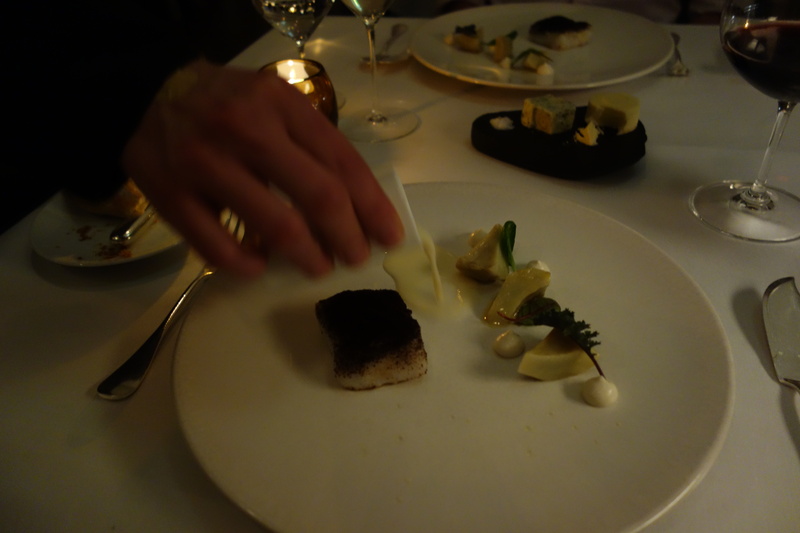 Again, I have no idea what the blobs were but it did not match well with the dish at all. It tasted… interesting, shall we say. This course was absolutely awful. 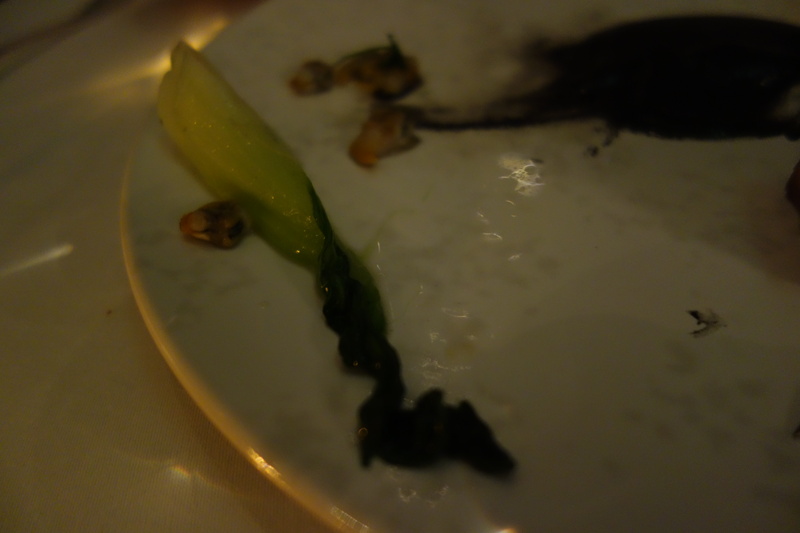 The second the plate was put in front of me and the waiter left, I said to J, “the pak choi is overcooked”. 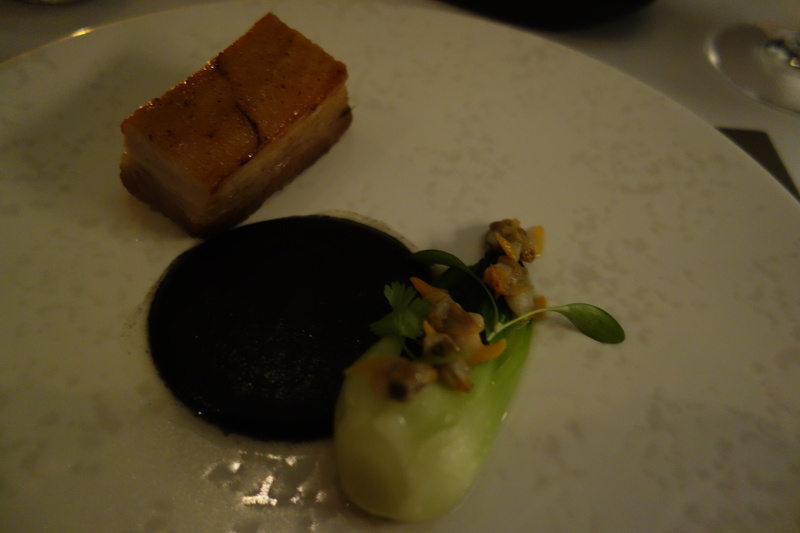 You can clearly see from the pictures – this is how not to do pork belly & pak choi. The pork belly is a big blob of fat and the skin is not crisp at all. And the pak choi is overcooked. Want to see how overcooked it was? Look at this. This is the saddest-looking pak choi I have ever seen that had obviously been boiled to death, and sadly it tasted as bad as it look. At one point I had to stop myself from gagging at its awful texture. I took the tiniest bite from the pork belly and left the rest. Sorry, but no. The meat was the way too… “porky“. The meat was chewy and the skin was soft in the worst possible way. 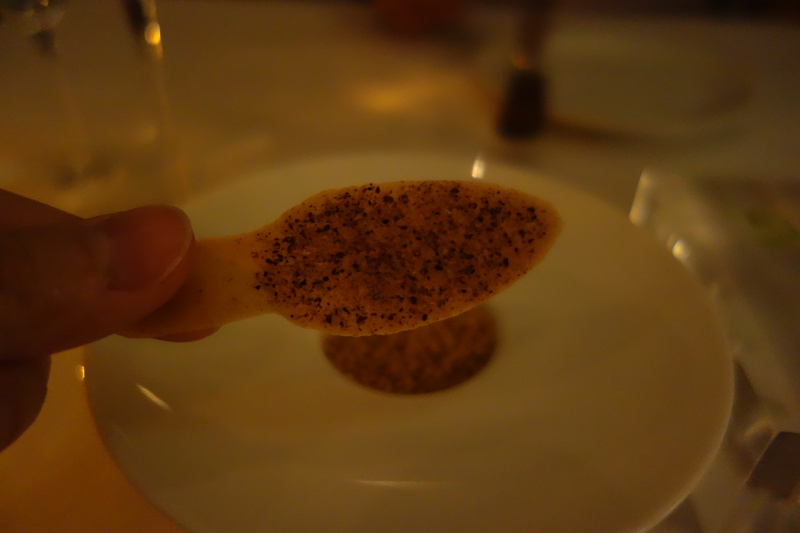 This was the most disappointing course of the entire meal, I couldn’t bring myself to finish it. In hindsight, I probably should have complained (and my colleague did say I should have) but I was too British to. That, and I figured the meal was supposed to be a good deal, so did not want to say anything. 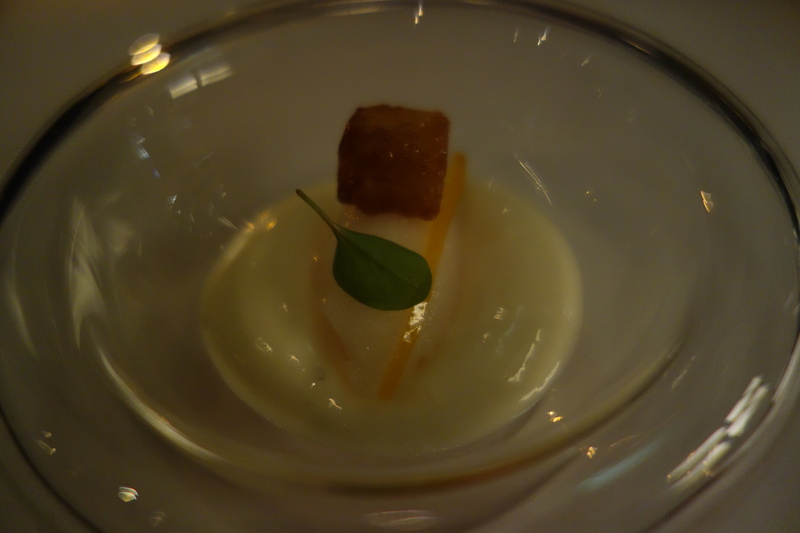 Jasmine/honey grapefruit pudding. A light, airy, flavoursome foam – and delicious. This was the only course I really liked. Chocolate desserts – a rich chocolate base with a droplet of pear that explodes in your mouth. 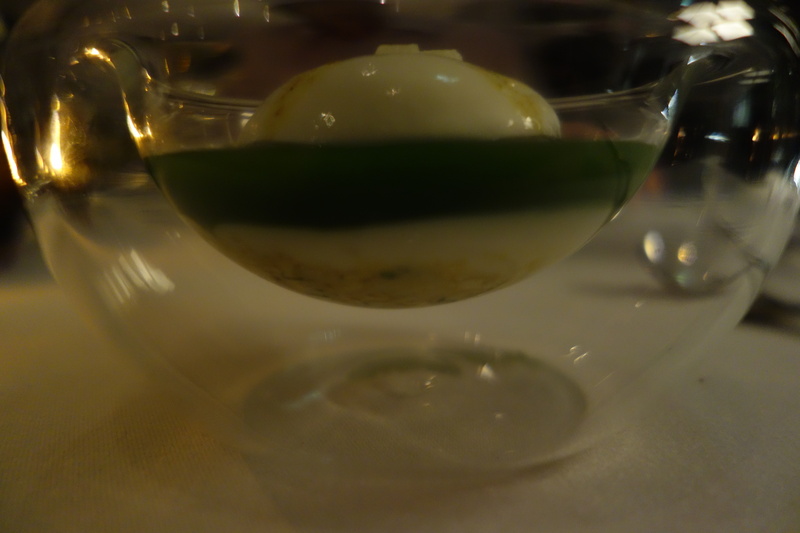 Highly skilled and beautifully presented, but again tasted… interesting. Experimental, I’d say. The pear droplet I found too sour and the chocolate I found too strong. 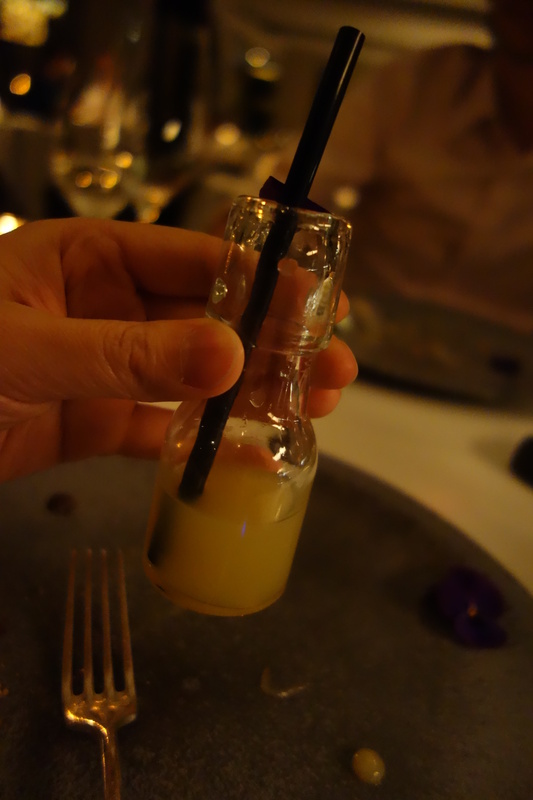 The mini bottle was a refreshing drink that I found a little too tangy. 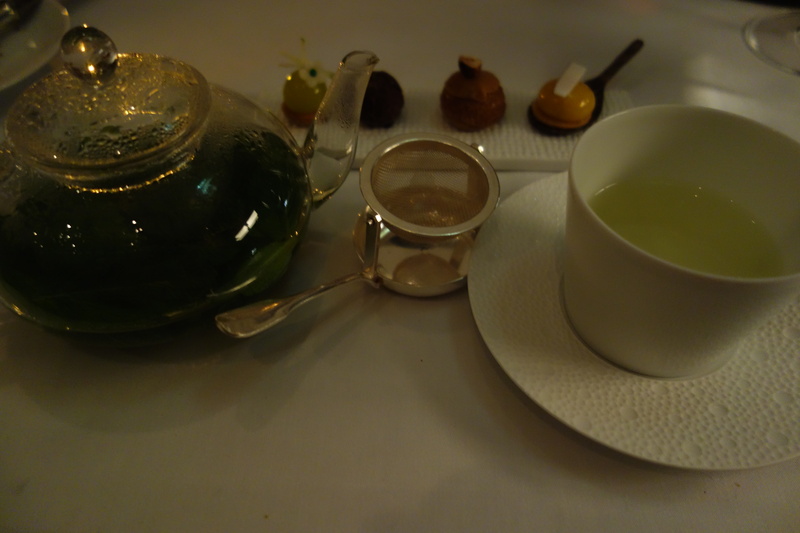 Finally, coffee (I opted for mint tea) & petit fours. 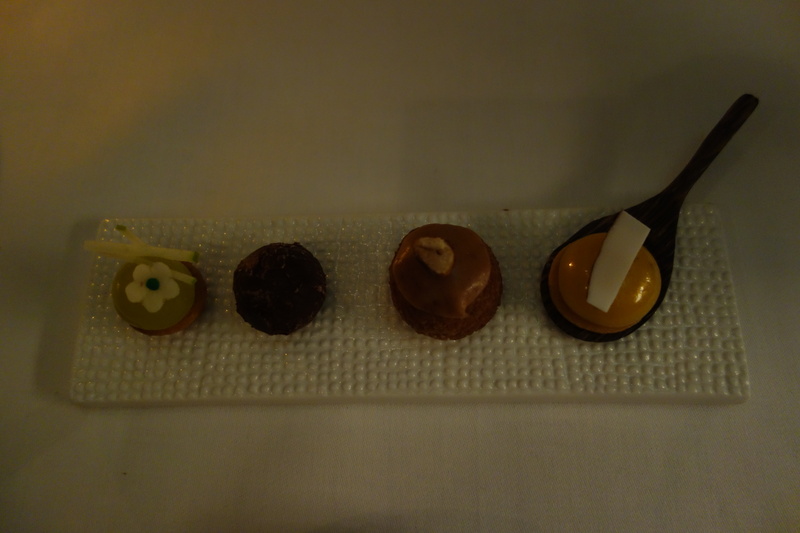 The petit fours were, again, interesting. The first one was so sour I was almost tearing up whilst furiously trying to hide the most unattractive face ever that I couldn’t stop myself from pulling. The second was chocolate: very rich, very chocolatey. I found it a bit heavy and couldn’t eat it all. This is where I did something incredibly stupid: I was sipping my tea and all of a sudden I spilled it all over the table and myself. 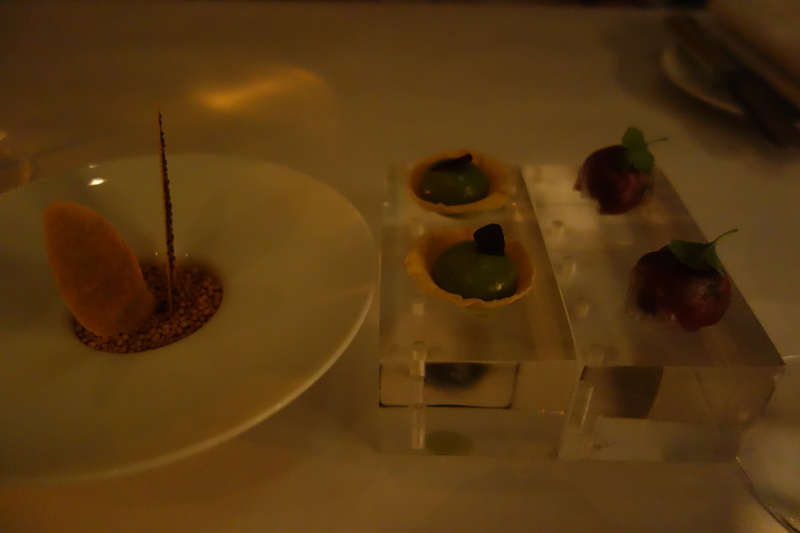 One of the waiters immediately came over and gave me two new, clean napkins (I’d used both mine and J’s for cleaning by this point), covered the wet tablecloth with a fresh napkin, got me a new pot of mint tea and insisted on getting me a new plate of petit fours as I’d spilled tea all over mine. I ate them all (except the sour apple one – J took that for me) and the other ones weren’t bad. Unfortunately far from what I would expect of a 2* Michelin meal. I was expecting to have my tastebuds blown away from excellence, fall in love with foods I’d never heard of and change my dislike of pork to adoration (trust me, it happens). Whilst this would have been an acceptable meal elsewhere, I don’t think one should walk into a 2* Michelin joint hoping for ‘acceptable’. Service, on the other hand, was a whole different matter. 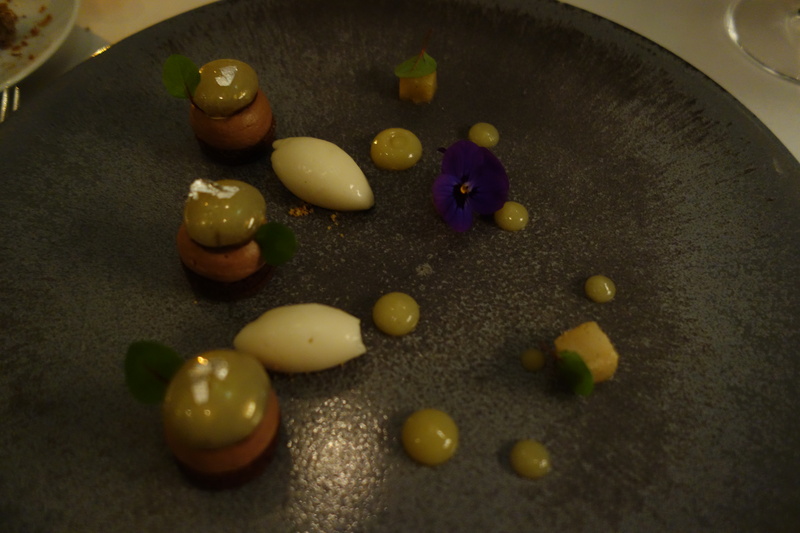 Stepping into the Greenhouse, from start to finish their service was absolutely outstanding. Rarely Never have I been to a restaurant with such fantastic service, it was worth every penny of the 12.5% service charge added to the bill. Every, single, penny. 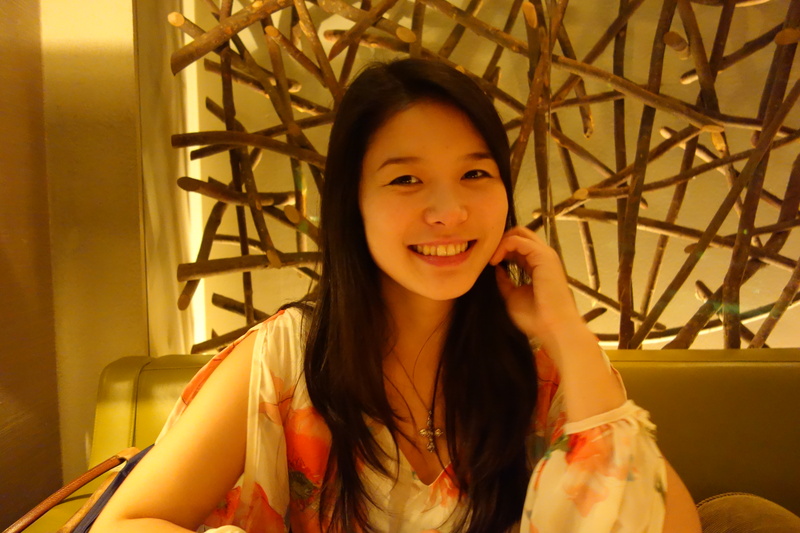 They were welcoming, attentive whilst not overbearing, friendly and every good word in the book. They will advise you of everything they just placed on the table (including chef’s recommendations of where to begin sometimes) although I’m forgetful and hungry so I don’t note it down. I guess that’s relatively standard. But more than that: they don’t just give you directions to the bathroom. You will stand up and someone will have read your mind, gently confirm that you are looking for the restroom? (You nod, yes) and they will personally guide you there and open the door for you. Upon your return, they would have folded your napkin, cleaned away any crumbs at your table and pull the table/chair out for you for ease of returning to your seat. Perhaps it was also a quiet evening, but all I needed to do was look up and someone would be walking over to our table immediately. I genuinely don’t think I can fault their service. Being ‘too good’, ‘a whole new level’ and ‘spoiling me for all service elsewhere’ surely would not count? Overall a pleasant evening in a wonderful location being waited on by the best staff a diner could ever hope for. But. Sadly the food was just not on par. Skill-wise, J and I both agreed that we were presented with technically challenging culinary art. Taste-wise, I’m sorry, but no. 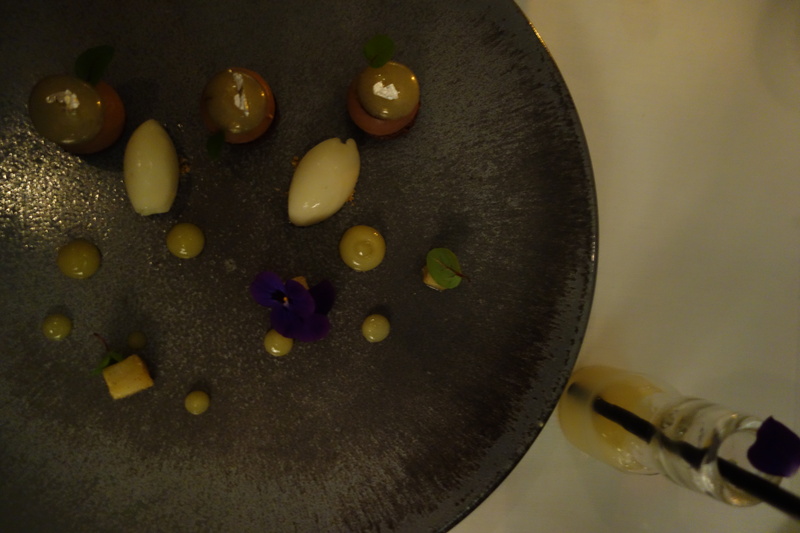 Perhaps they were trying too hard or attempting to be too creative without considering if all the elements on the plate worked together or even how the food might taste at all at times. 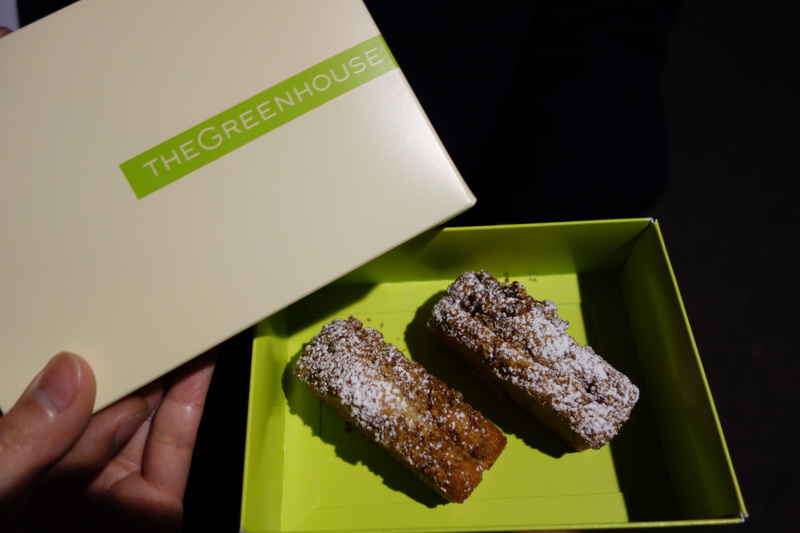 I’d rate The Greenhouse 5/5 for service. Even 6/5 for service – it’s a league of its own as far as I’m concerned. But for food, on a scale of 0 – 5, I’d rate it -1/5. Or maybe even -2/5. Yes, this one’s going into the negatives. Ouch – too far?, you ask. No. There aren’t many restaurants I’d rate in the negatives, but then again there aren’t many restaurants capable of making me gag. Part of that can be chalked down to me just downright refusing to eat certain foods most of the time, but I’m willing to try anything at a highly rated restaurant. If the cooking is exceptional, my mind can be and is often changed. 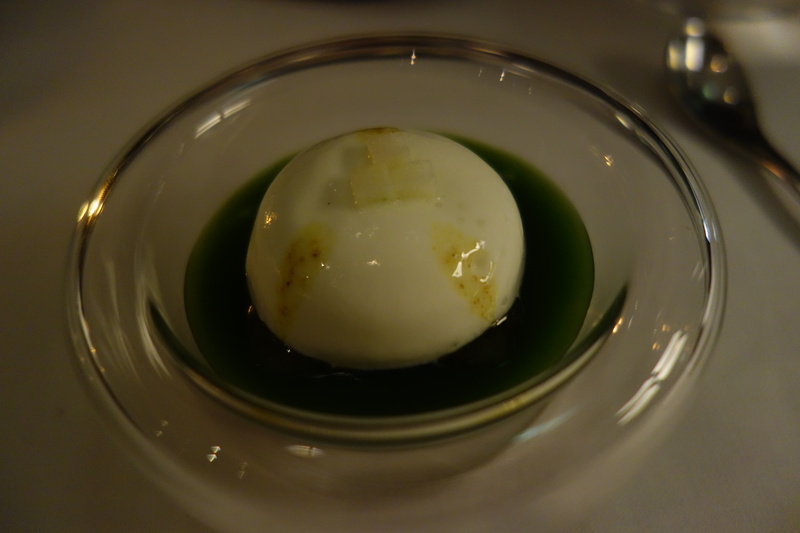 I hate and often gag at cheese but I have enjoyed eating cheese when it simply worked at an Italian restaurant before. I also don’t like pork but when served pulled in a bun or falling off the bone with Knödel at any German pub I will instantly be put in food coma heaven. As far as I’m concerned, a 2 Michelin Starred restaurant should be able to serve me pigs brains and locusts and have me like it. That’s what I was hoping for – my culinary senses to be challenged in a good way and to see certain foods in a different light. My culinary senses certainly were challenged I guess. I physically gagged at one point (eating disgustingly overcooked pak choi), I think that’s enough said. At one point I did joke to J that we should just leave and go to McDonald’s instead. Apparently a 6 course meal costs £110 per person when not on offer. Do you have any idea how many McDonald’s that would buy you?! 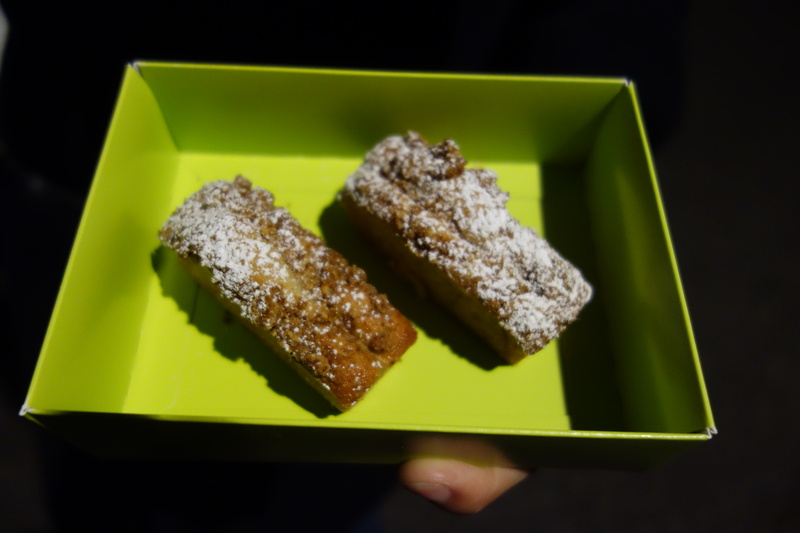 I also forgot to mention the portions were indeed tiny. But you already knew that from the photos. I wouldn’t say I was still hungry after, but I was not full and definitely not satisfied. It’s such a shame as well. Ah well, how ’bout a fashion pic or two to make up for it? 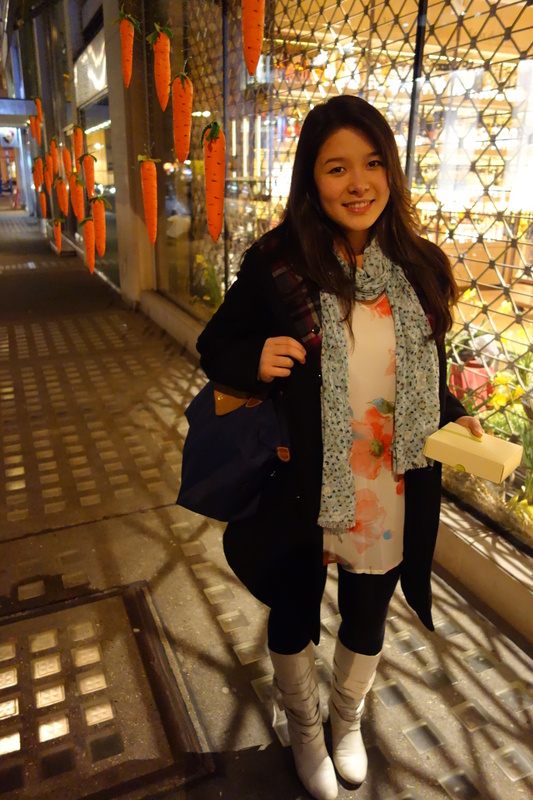 We saw these carrots dangling outside a shop on our way back and I had to take some photos with them! Aren’t they cute? 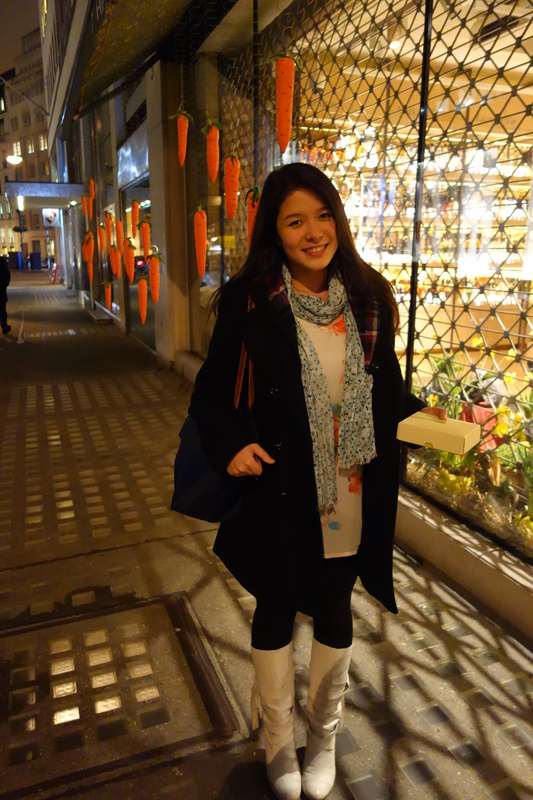 I am in a bargain dress from Sheinside, Reiss scarf and some gorgeous old boots from a friend of mine. How was your Easter weekend, did you get up to much?? Go on, let me know. Drop me a note? Don’t be a stranger!